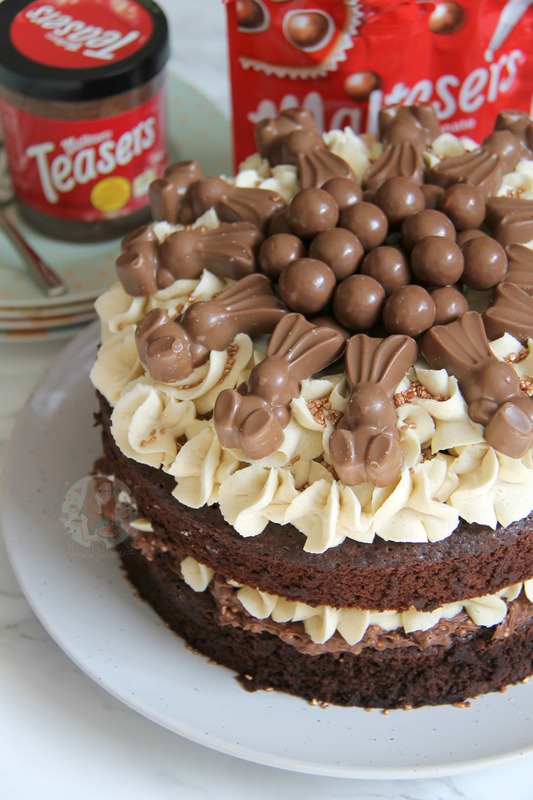 A Two Layer Chocolate Malt Sponge, with Malteser Spread Filling, Malt Buttercream Frosting, Malteser Bunnies, Maltesers, and Sprinkles! 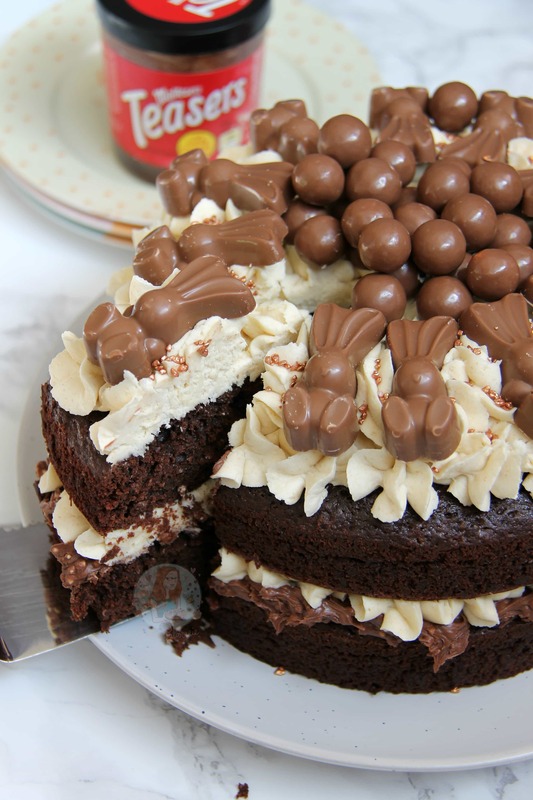 Perfect Malteser Cake for Easter. 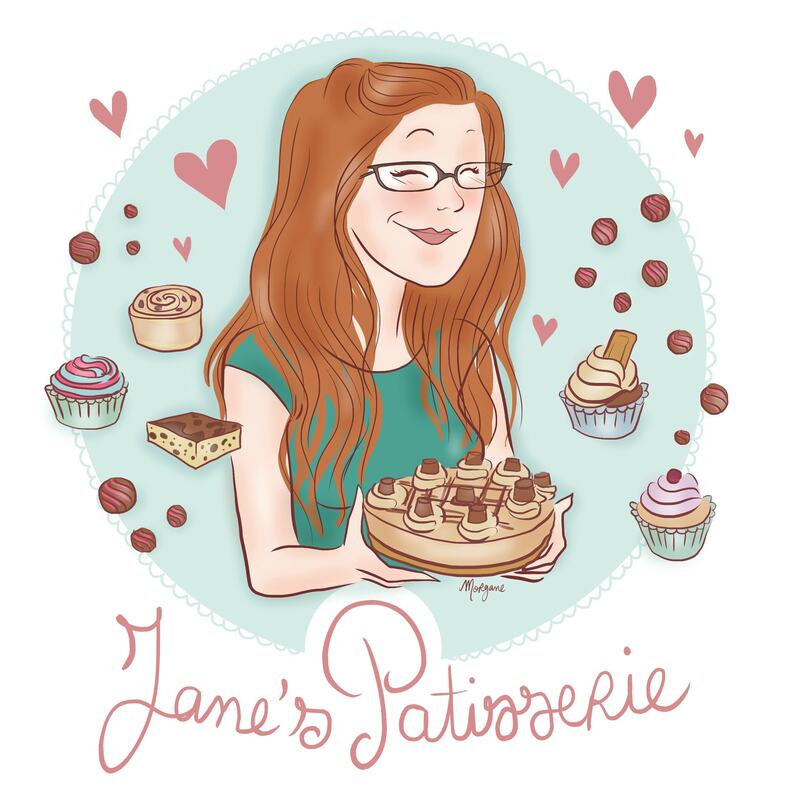 So, I have had what feels like an INSANE amount of requests for this recipe. Like, I have genuinely lost count! 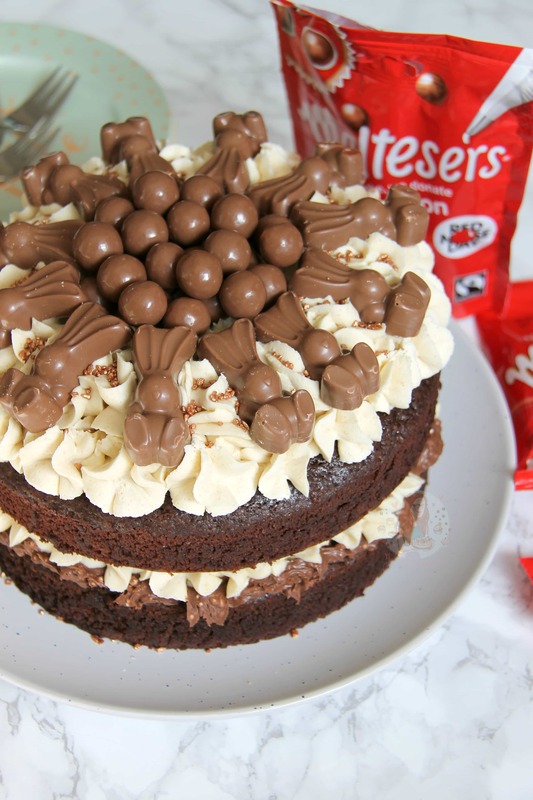 I have always said so far to multiply up my Malteser Cupcakes recipe, which would also work, but I wanted to make this a whole new level of delicious. I based this on my Chocolate Fudge Cake and some ideas from my Honeycomb Crunchie Cake as well. All in all, its definitely one of my new favourite recipes. It’s just basically insane. Every mouthful is delicious! My No-Bake Chocolate Malteser Cheesecake and Cornflake & Malteser Rocky Road recipes have always been popular, but this is only my fourth malteser recipe. 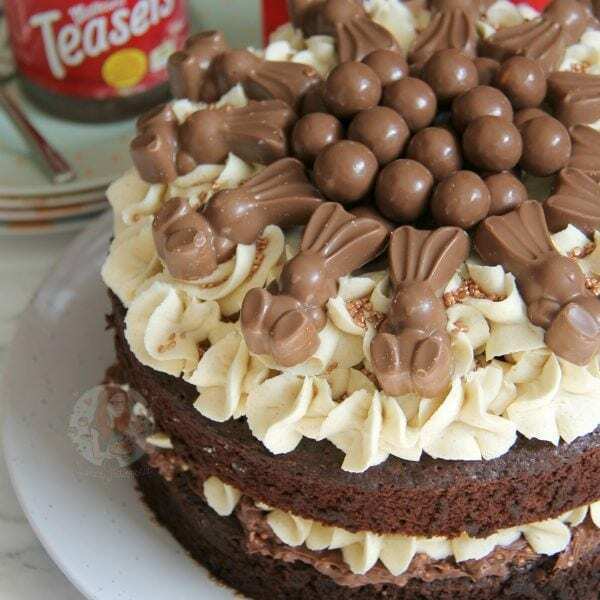 I feel like I have neglected them slightly, but as Easter is around the corner, and Malteser Bunnies are everywhere, I knew this was the right time for this delicious cake. I altered the Chocolate Fudge Cake to be slightly more fudgey, less coffee like, and put in some Malt powder. Some people say they can taste the malt powder, some can’t, so if you watched my baking vlog about this, you will see I only put in 50g of Malt Powder. However, I decided to bump it up to 75g to increase the flavour! Either way, it helps it create a nice sponge, and along with the spread and buttercream, you don’t need the sponge to be oh-so-malty. 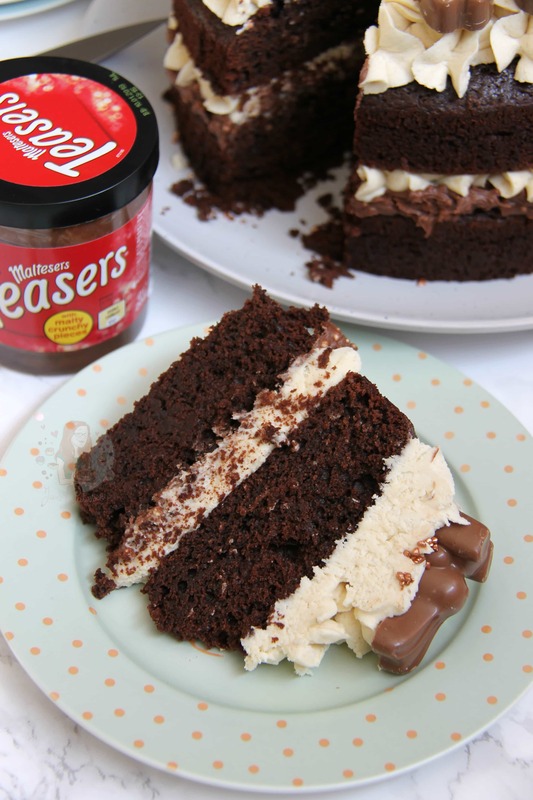 In my mind, this cake was so much better with the Malteser spread in the middle because it gave it more flavour, more sweetness, and another element of Malteser Heaven but it is of course optional. I wouldn’t blame anyone if it all accidentally fell into their mouth and none made it to the cake because you know, I mightve had to have bought another jar as this happened to me… anyway. The Malt Buttercream is lovely and malty, making it less sweet than normal buttercream frosting, so it combats the other sweetness making it the perfect amount. The cake is quite dense, but it makes it SO FUDGEY and delicious. My Taste Testers were super happy with this cake, and already want it again. I had my slice after photographing it, and now I wish I hadn’t give the rest of the cake away because I am craving more! Enjoy! In a heatproof bowl, microwave the Dark Chocolate & Butter till melted – mine takes two minutes! Add the Coffee Granules and Horlicks Powder into a bowl, and add 125ml Boiling Water and mix – add the coffee/malt mix to the Chocolate/Butter mix and stir well till smooth! Pour the mixture into the two tins and bake in the oven for 45-50 minutes (can take a little longer in some ovens, can take less time, check at 40 minutes) A skewer should come out clean, and the cake should be silent (if not fully baked, it’ll make a bubbly/crackling noise). Leave for 10 minutes and cool fully on a wire rack. With an electric mixer with the paddle attachment, beat the butter until its very smooth and supple (couple of minutes). Add the Icing Sugar in in two parts, and beat each time. With the second addition of Icing Sugar, add the Malt Powder as well! Beat till combined, add in a few tablespoons of boiling water to loosen and beat for a couple of minutes so its extra smooth & creamy. 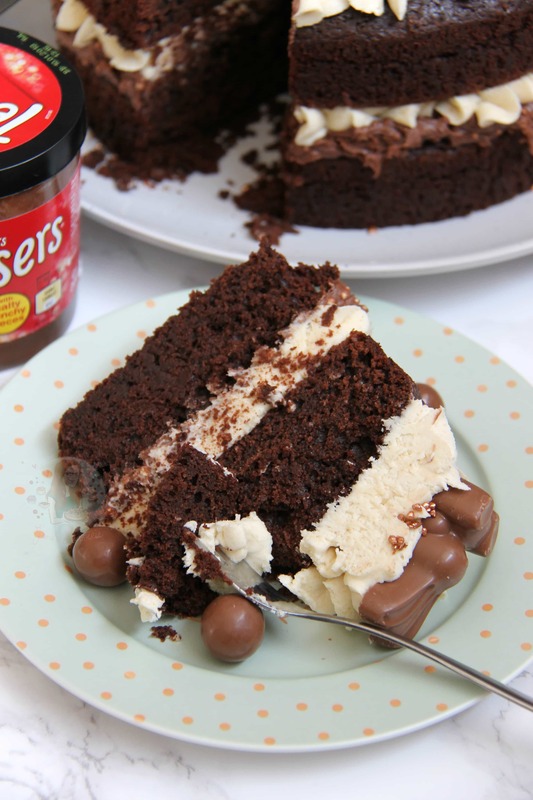 Once the cakes are cool, spread the tub of Malteser Spread onto the top of the bottom cake. Pipe on some buttercream, and add the second sponge. 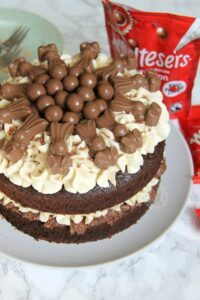 Pipe on the rest of the buttercream, and then decorate with some Easter Malteser Bunnies, Maltesers and some sprinkles! You can watch me make this HERE! And Save this recipe on Pinterest HERE! I used the Horlicks powder for my Malt Powder that mixes with Milk, but you can also use ovaltine, or any other malt powder. 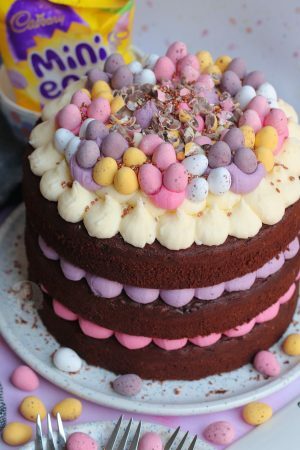 If you can’t access the Buttermilk, or you would prefer to use something else then you can use Double Cream in the cake – however it might not be as moist, but there shouldn’t be much of a difference at all! You can also bake this into 3 layers using 3 20cm tins – they will take 22-25 minutes in the oven, but will be very thin! Inspired by BBCGoodFood and my Malteser Cupcakes. 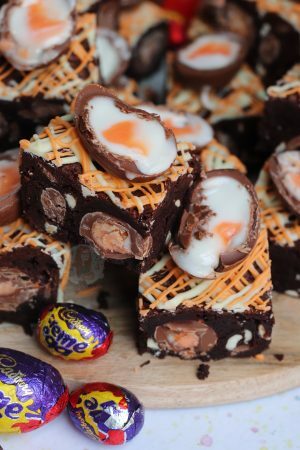 Older Next post: Easter Brownies! Newer Previous post: Easter Chocolate Millionaires Shortbread! Hi Jane, i made this cake the other week and it was delicious. I was wondering could i make it into cupcakes and what the quantities would be? I would halve the recipe for 12! What type of dark chocolate would you recommend and what size are your tins? Anything that is 70% or darker – supermarket own is absolutely fine! And the tins are mentioned in the first bit of the method. Do i have to use the coffee powder? Can i just use 2 extra spoonfuls of Horlicks instead? I would advise using the coffee for the chocolate fudge taste – it doesn’t taste coffee like, it just really helps with the chocolate. Ohhh okay got ya i was worried it would taste like coffee lol… I’ve only got granules is that okay? It’s not powdered? 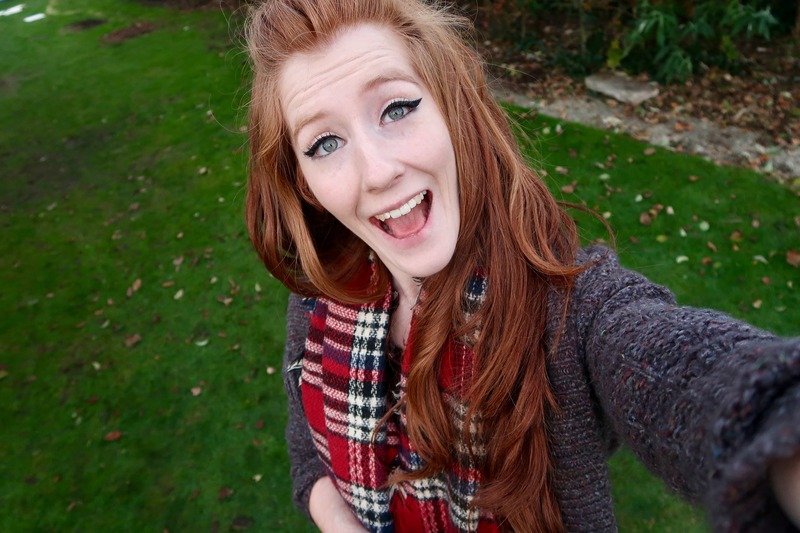 Oh great thank you, its turned out SO well!!! Pics to follow ☺ also how do i store it? Wow, this looks amazing! 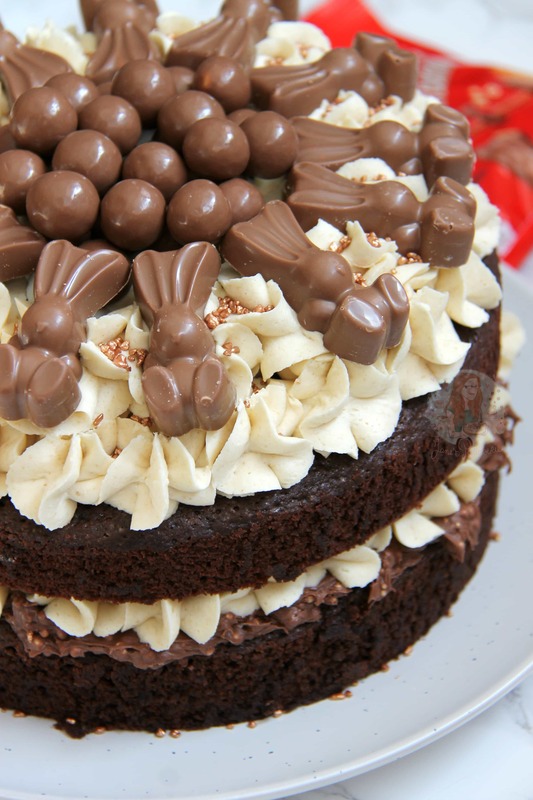 I really want to try to make it, the bunnies make it look so cute. Baked your malteser cake to celebrate the arrival of a new baby in the family! Was absolutely loved by all! The buttercream was especially loved! hya wondered if i could use milk chocolate instead of dark ? Also i dont have an electric mixer with a paddle attachment like it states in the recipe, i only have an electric mixer/whisk? Will this be okay to use? Want it to be perfect lol! And for the buttercream that will be fine! You don’t need to use it for the actual cake. 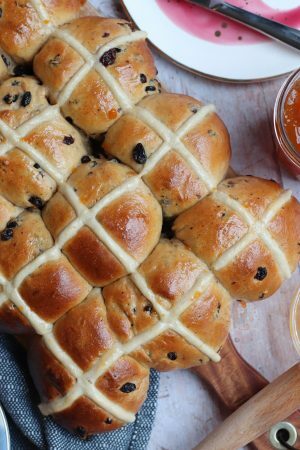 I love all of your recipes and have tried a few already! I was planning on doing a giant cupcake cake in a moulded tin, and wondered whether this recipe would work for that? It’s normally a 6 egg recipe so if I amend the quantities and bake it for a bit longer do you think it would still come out Okay? Hi, what type of piping nozzle did you use for this cake? Hi it’s seems so delicious and pretty. I would to ask you about Malt Powder what is it? And what’s the replacement? Thank you so much. Malt Powder makes a Malt drink, kind of like Hot Chocolate (but slightly different). Are you from somewhere out of the UK? It might be worth googling an alternative from your country.